Interested in applying for financial aid at Pittsburgh Seminary? Simply follow the steps outlined below. Please note the Seminary's Federal Code is G03356. The Department of Education prohibits the transmission of personally identifiable information (ex. social security number) by unsecured e-mail. Master's degree students interested in merit scholarships must complete the Admissions application. No other documentation is necessary. All students applying for aid at PTS must file a Free Application for Federal Student Aid, FAFSA, with the Department of Education. The FAFSA collects information used to calculate the Expected Family Contribution (EFC). The Department of Education provides the information to the school to help determine eligibility for institutional aid, outside scholarships, federal loans, and private loans. There is no charge to file the FAFSA. It may be filed electronically or with the paper form. Students are encouraged to apply online with FAFSA on the Web at www.fafsa.ed.gov. Help is available at 800-4-FED-AID (1-800-433-3243). Students are encouraged to use the IRS Data Retrieval Tool (IDR) while completing the FAFSA. This simplifies the process by allowing the filer to download income tax information directly into the FAFSA. By entering PTS's Federal School Code, G03356, the Financial Aid Office will be able to download your information. All students must submit a PTS Financial Aid Application each year to be evaluated for institutional grants and work-support. Applications will only be considered for the specified length of the degree program. There are separate applications for those enrolled in the master's programs and the doctoral program. All complete applications are processed on a “first come- first served” basis until funds are exhausted. ** Students who do not use the IRS Data Retrieval Tool (IDR) when completing the FAFSA must contact the IRS to request a Tax Transcript. Upon receipt, the Tax Transcript will then be submitted to the Financial Aid Office. PTS recommends that students implement the IDR when completing the FAFSA. The federal government has a process called "verification". PTS may verify the FAFSA items that are selected for verification by the federal government's Central Processing System and/or exhibit conflicting information. The Seminary's Financial Aid Office will notify the students in writing if they are selected and advise of the required documentation. If the school has conflicting information concerning the student's eligibility or the Financial Aid Office has any reason to believe that the student's application information is incorrect, the discrepancies must be resolved before any institutional or federal funds can be disbursed. PTS Verification Forms can be found at Financial Aid Forms and Helpful Links. After filing the Free Application for Federal Student Aid (FAFSA), masters-level students must submit a Federal Direct Loan Request Form to the Financial Aid Office. Be sure to submit the form for classes taken in Summer, Fall/Spring, and/or the J-Term. PTS does not certify federal loans for the Doctor of Ministry program or certificate-only enrollment. New borrowers are required to complete a Direct Loan Master Promissory Note (MPN). The MPN is a legally binding agreement to repay the loan. In most cases, one MPN can be used for loans over 10 years of study. A valid MPN may follow the student through undergraduate and graduate school. A Direct Loan Entrance Counseling Session must be completed before the loan funds may pay into the school. This is a federal regulation for first-time borrowers. Students should plan to visit the Financial Aid Office to discuss loan options and repayment. For additional details about Direct Loans, visit Applying for a Loan. Students must reapply for financial aid each academic year. The Department of Education will e-mail a reminder to complete the FAFSA Renewal Online. A FAFSA must be completed each year with the "prior-prior" year's financial data. Students do NOT have to complete a new Federal Direct Loan Master Promissory Note or Federal Entrance Counseling Session but must submit a new Direct Loan Request Form to the Financial Aid Office each year. 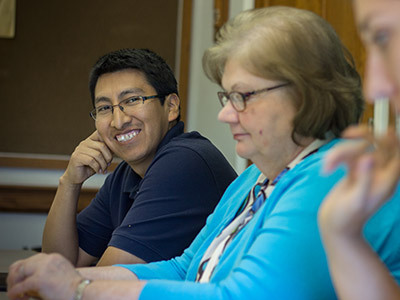 After grades are posted in June, loan processing will begin for the new academic year..
Students must apply for institutional grants each year by submitting the FAFSA, and the Master's PTS Application or DMin PTS Application. In addition to applying on time, each year students must demonstrate need and meet the satisfactory academic progress (SAP) requirements. Merit scholarships are awarded to incoming students. Funds are automatically renewed if students meet the satisfactory academic progress requirements (SAP) stated on the contract. The FAFSA collects information used to calculate the Expected Family Contribution (EFC). The Department of Education provides the information to the school to help determine eligibility for Seminary aid, some outside scholarships and private loans. There is no charge to file the FAFSA. It may be filed electronically or with the paper form. Students are encouraged to apply online with FAFSA on the Web at www.fafsa.ed.gov. Help is available at 800-4-FED-AID (1-800-433-3243). All students must submit a PTS Financial Aid Application each year to be evaluated for institutional grants. Applications will only be considered for the specif ied length of the degree program. There are separate applications for those enrolled in the master's programs and the doctoral program. The Department of Education prohibits the transmissiion of personally identifiable information (ex social security number) by unsecured e-mail. PTS does not certify federal loans for the Doctor of MInistry degree. For more information on applying for a private loan, visit the Loans section of the PTS website.